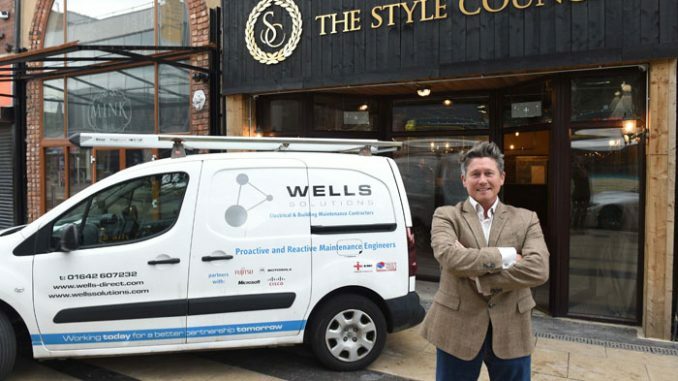 Family-run electrical, mechanical and building maintenance and refurbishment company Wells Solutions is celebrating after landing one of its biggest-ever commercial bathroom contracts. The firm – which has offices in Stockton’s Fusion Hive and Sittingbourne, Kent – has signed a £1.6m deal with bus operator Arriva London to carry out commercial bathroom refurbishments in its depots within the M25. Wells fended off some of the industry’s major players to win the contract and founder and managing director Garry Wells believes their high-quality work on previous jobs for both Arriva London and Transport for London were key to their success. And he says the thriving relationship they are forging with Arriva can lead to further work across the country. “We’re establishing an excellent nationwide reputation for our commercial bathroom work, as well as being able to carry out commercial work such as electrical, floors, ceiling, walls, maintenance, plumbing and heating,” said Wells. Garry started the business in his garage in 2002 and now employs a team of 17 staff, which can rise to 35 at peak times. The company have invested in its own offices and warehousing facilities and prides itself on keeping their engineers up to date with the latest training and technology. “We’re constantly striving for perfection and aim to give our clients what they want, how they want it and when they want it, with minimal disruption to their business,” adds Wells. While understandably proud of its growing list of blue chip clients across the UK and Europe, Wells are also keen to show that they are equally at home working with small businesses and start-ups, especially here in the North-East where they have their roots. As well as converting Middlesbrough’s Reed House into student apartments, recent work also includes refurbishing a beauty salon, a hairdresser and a supermarket. But one of Wells’ favourite projects has been turning a former vape shop into Middlesbrough’s newest microbar, The Style Council on Corporation Road. The impressive refit includes trendy exposed brickwork, copper tables, wooden wagon wheels-turned-lamp shades and beer barrels. “It was extremely satisfying to strip back a building with such a rich history and then build it back up again to such a high standard,” said Wells. Wells Solutions is NICEIC-approved with TrustMark, Gas Safe and ISO 9001 & 1800 accreditations as well as being licenced to work in specialist areas such as defence and security. For more information about their services, visit wellsolutions.com or call 01642 607232. Wells Solutions believe in giving back to the community. It’s the reason why every year they work with the local community partnership to install without charge Ingleby Barwick’s Christmas lights. Up to five staff spend three days installing the extravagant display that local children – and the entire community – looks forward to.